Today, the Roselle Park Dental & Implants team is proud to utilize several state-of-the-art technologies for the sake of our patients, including digital X-rays. There are several oral health problems that simply can’t be viewed on the surface of your smile, and these comprehensive images allow our doctors to locate and treat them effectively. Plus, digital X-ray technology is a major improvement when compared to traditional film, providing faster, safer, and more environmentally friendly results. If you’re ready to schedule an appointment for you or a loved one, please contact our Roselle Park, NJ office today! What Are The Benefits of Using Digital X-Rays? Instead of having to use a darkroom to slowly develop X-rays, the digital images are immediately sent to our computer system for easy viewing – no waiting required. 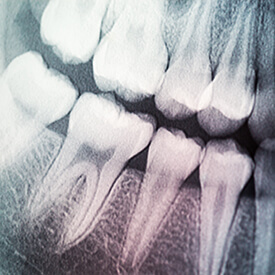 Digital X-rays can be easily modified for educational purposes, including magnification, rotation, and even color-coding. There’s no longer any need for bulky storage systems. Files can be transferred easily to other doctors and insurance companies when needed. Digital X-rays produce a significantly lower amount of radiation when compared to their traditional counterparts, which means they’re much better for the health and safety of our valued patients.